OTTAWA - The Canadian economy shrank in the second quarter as a number of one-time shocks rippled through the economy, taking their toll on the key exports sector. But economists said Wednesday that it was unlikely the country would make a second misstep and slip back into a recession as growth is forecast to return in the second half of the year — albeit modestly. 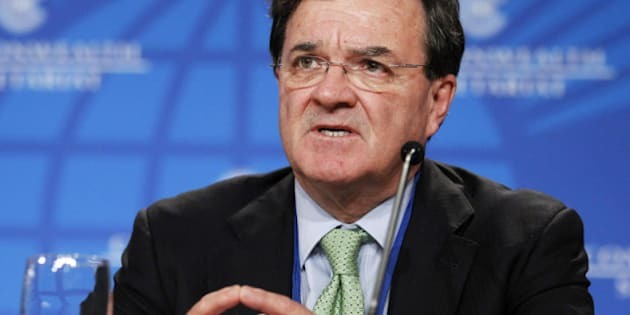 Finance Minister Jim Flaherty said that despite the weak second- quarter numbers they were "broadly consistent" with expectations in the budget and he expected modest growth in the third and fourth quarters. "As we all know, global economic growth has been softer in recent months and this impacted Canada as part of the global economy," he said in Toronto. "We are in a period where the global economic recovery — especially in the United States and Europe — is fragile and growth will be modest." Statistics Canada said Wednesday that Canadian gross domestic product shrank 0.1 per cent in the three months ended June 30, or at an annualized pace of 0.4 per cent. The agency also revised its take on the first quarter, down from an annual growth rate of 3.9 per cent to 3.6 per cent. Economists on average had expected no growth from the Canadian economy in the second quarter as the earthquake and tsunami in Japan disrupted North American manufacturing and wildfires and maintenance work cut into oil and gas production in Alberta. NDP finance critic Peggy Nash called on Flaherty to help buffer the economy from the slower than expected growth in the U.S. by spending at home. "He can't control consumer demand or business demand in the U.S. or in Europe, but what he can do is invest strategically in Canadian infrastructure for example to increase demand here in Canada to take up some of that slack," she said. Despite the contraction in the quarter, TD economist Diana Petramala said the bank does not expect the economy to shrink again in the third quarter. Two consecutive quarters of contraction is the definition widely used by economists to define a recession. "That being said, the rebound in the second half of 2011 will not be robust," Petramala wrote in a note to clients. "This morning's report is a reminder that Canada is not an island, and is vulnerable to external economic shocks." Economist David Madani of Capital Economics said the recent turmoil on the stock markets as well as lower consumer confidence and slower than expected household spending were all risk factors for the second half of the year. "The good news is that business investment remained very strong in the second quarter, increasing by over 15 per cent, following similar growth in previous quarters," said Madani, who forecast growth to accelerate to an annual pace of 2.5 per cent in the third quarter. "Favourable commodity prices, respectable profit margins and easing access to credit should continue to spur investment growth in the quarters ahead." Exports of goods and services fell 2.1 per cent, the first decline since the third quarter of 2010, as energy exports fell 6.7 per cent due to wildfires in Alberta and maintenance shutdowns. Government spending was up 0.4 per cent as all levels of government increased spending. Consumer spending on goods and services was also up 0.4 per cent for the quarter as shoppers increased their purchases of durable goods as well as services. Flaherty said that although the economy "paused" in the second quarter, growth in consumer demand and in investment in machinery and equipment indicates Canadians have faith in the recovery. "The weakness in Q2 was largely due to external factors — the tsunami and earthquakes in Japan in the second quarter had a very strong effect on the auto sector, particularly auto imports," he said. "And of course there was some slowness in U.S. growth, so that affected our exports. The domestic situation is much stronger." The U.S. economy grew at an annual pace of one per cent for the second quarter. Liberal finance critic Scott Brison noted that Flaherty's budget had expected the U.S. economy to grow 3.1 per cent this year, a mark many now believe will not be achieved. "If the U.S. goes into a full fledged recession, that will have an even more significant affect on our economy," Brison said. At a G7 meeting in two weeks in France, Flaherty said he will discuss concerns about sovereign debt and about how the U.S. can move back toward fiscal stability. Continuing turmoil over government debt in Europe and signs of slower than expected growth in the United States have sent the Toronto stock market down from its highs for the year. Flaherty said there's concern about the limited tools to stimulate the economy that the U.S. Federal Reserve has in its arsenal given that it has already pledged to keep interest rates ultra low. In Canada, where the Bank of Canada overnight lending rate has risen since the recession to one per cent, there is more room to play with its interest rates if needed, he said.